N is for… New Experiences! Wednesdays during the summer my brother and my cousins and I would spend the day with my aunt. We were primarily interested in the backyard pool at my aunt’s house, but my aunt committed herself on those days to making sure we had a “new experience.” We “had a new experience” at the top of mountains or in unfamiliar restaurants or down winding country roads – any place my aunt could think of to take us out of our routine. The phrase “have a new experience” inevitably drew eye rolls from our teenage selves back then, and it is still guaranteed to pull a chuckle from our forty-year-old selves today. I’ve heard my cousin use the phrase with her kids. None of us have gone on to be globe trotters or wild adventurers, but there is no denying that the idea of new experiences as valuable has stuck with us. Having new experiences is a habit that has to be learned just like exercise or healthy eating. The important thing to remember is that a new experience does not necessarily mean going to extremes. Certainly backpacking through Africa would be a spectacular experience, but visiting a new museum in your hometown can be pretty amazing, too. Just starting at the “finish” of the path in your neighborhood park instead of the beginning can show you things from an entirely different perspective. My latest new experience is happening this weekend. Next Monday is my birthday and rather than our usual dinner out my family has agreed to get up early on a Saturday to go visit Maryhill Museum on the Washington side of the Columbia Gorge. Technically we have been there before, but it’s been at least 30 years so it really will be new again for all of us. I can’t wait! Pushing outside our routine doesn’t just open our mind it feeds our inner artist too. I hope you will have a new experience this weekend. Try a new restaurant or buy a shirt in a bright color instead of a neutral or join an exercise class you haven’t been to. It doesn’t have to be scary or give you a stomach ache – it just has to be new. 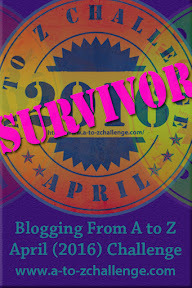 This entry was posted in Blog and tagged #atozchallenge, Nicole Gordon. Bookmark the permalink. ← M Is For… Maps! – by Rachel Wilder! Fantastic advice! And I like your aunt. ~grin~ I'm about to join some local writing friends that I met during NaNoWriMo last November. I'm so glad I tried that new experience of driving out to a new-to-me coffee shop for a write-in with total strangers. Nervous back then, I still get butterflies even though I know these folks now. But it feels good once I'm there. Happy adventuring! I love your post, Nikki. I think the idea of going back to the Maryhill Museum is an awesome way to celebrate your birthday! I hope that you have a great time.